Click here to open the infographic in another window. The commercial kitchen can be a very busy place. 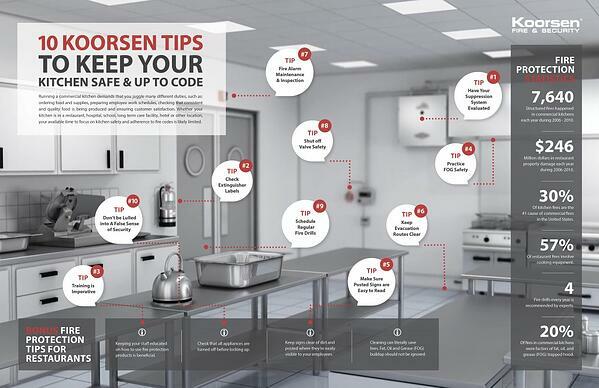 Whether it is in a restaurant, hotel, hospital, school or other location, a lot can go right but a lot can go wrong if you don’t keep the kitchen safe and up-to-code. A little due diligence and prep work to ensure your kitchen is safe for your staff and patrons can go a long way to reducing any unnecessary risks, devastating disasters, and costly fines. To help you keep your commercial kitchen safe and in compliance, we’ve created a helpful infographic with tips to keeping your kitchen up-to-code and running smoothly and reminders of what can happen if you don’t. For a free on-site hazard analysis of your kitchen or to learn more about Koorsen’s fire and security services, contact a Koorsen associate today. Is your fire suppression system sufficient enough to put out a high-temperature vegetable oil fire? Has it been inspected recently? Does it meet UL300 rated regulations? At Koorsen, we can do a full inspection on your kitchen suppression system ensuring it is operable, it meets code, and it is ready to put a kitchen fire out. A quick look at your fire extinguisher tags can tell you if you need to call us or not. If the tags are expired, you’ll want Koorsen to inspect and tag them before you are fined by the fire marshal or you experience a fire where you need the extinguisher to work. Are your employees properly trained to use a fire extinguisher? Do they know what to do in case of a fire? Koorsen can train your employees on how to use a fire extinguisher, how the suppression system works, and what to do if a fire does break out. Fat, oil and grease (FOG) buildup in a kitchen can be deadly if a fire breaks out. While it’s important to train your employees the proper way to clean and dispose of FOG, there are certain areas where it can be difficult if not impossible for your employees to keep clean. Koorsen can help keep your kitchen free of FOG by providing regular hood and ventilation cleanings. If you have posted evacuation directions and other safety guidelines, it’s important to keep them visible and unobstructed from your employees’ view. Also, make sure all of your exit signs are properly lit and visible for both employees and patrons. Don’t use exit hallways and routes to store extra boxes or tables and chairs. All exit routes should be kept clear so everyone can exit safely and quickly in case of a fire. Not only is obstructing an exit dangerous, it is also a code violation. A fire extinguisher or fire suppression system will not always be able to put out a fire. It is important to have your fire alarm inspected and maintained on a regular basis to ensure that it will work to alert the patrons as well as notify the fire department. Does your gas valve shut off automatically if there is a fire? If you don’t know this, you will want to check it. If it is a manual shutoff, then you will also want to train your employees on how to shut it off in case a fire breaks out. It's important that your employees know what to do in the event of a fire or other emergency. Practicing fire drills regularly will ensure they know the appropriate evacuation route, and helps to identify any areas of confusion that need to be further practiced. Evacuation routes should also be clearly marked and kept clear (refer back to Tip #6). You may have never experienced a kitchen fire and hopefully, you never will, but failure to inspect and maintain your fire protection systems and properly train your employees on a regular basis can lead to disaster. Partner with Koorsen to ensure that all of your fire protection needs are met in your commercial kitchen and dining areas. Fires cause over $246 million dollars in restaurant property damage each year. Make sure your restaurant isn’t one of them. Contact a Koorsen Fire & Security professional for the installation, maintenance, inspection and testing of your fire protection system.